When I researched dining options in Seattle, Revel's name came up time and time again. But alas it was too far from my hotel to be feasible without a car or a hefty taxi fare, so we didn't plan to go there. On our last morning in Seattle we picked up a car to drive to Portland. Since it was still early, we figured we'd head over to Fremont for its Sunday market and grab some breakfast there. Well lucky us, Revel is open for brunch, so we got to check it out after all, and man I'm glad we did. Revel is known for its Korean influenced food, so I wasn't quite sure how that would translate into brunch. Turns out it Korean tinged brunch is quite a bit more exciting than pancakes and omelets will ever be. 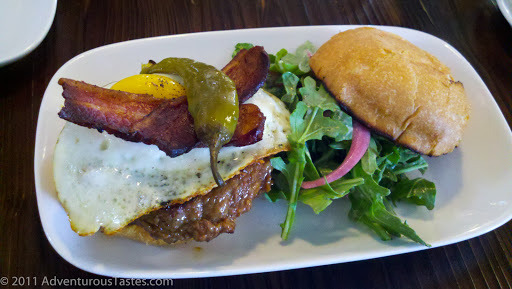 The Kalbi burger served with an egg on top, bacon, and a pickled pepper was quite simply divine. Kalbi is a Korean-style marinated short rib. I'm not exactly sure how that translated into a burger (were short ribs ground with regular beef?) Whatever it was, it was flippin' awesome. The sweet Asian glaze balanced the savory and fatty burger, bacon and egg, and runny yoke makes everything better. Even better, there was no wait for brunch and the open kitchen had seating reminiscent of eating at the counter in someone's home kitchen, which was pretty darn cool. Revel is exactly as hip as you'd hope something in the funky Fremont 'hood would be. I would like to have a burger like this all the time - is anyone in Atlanta making burgers like this? Considering the burger overload here, you'd think, but I can't think of one off the top of my head. Upon some research, there is an entire chain of burger restos in LA called Kalbi Burger. Color me jealous. I can't find a recipe online but here's a marinade for Kalbi that you could use on a burger if you can't get to the west coast!